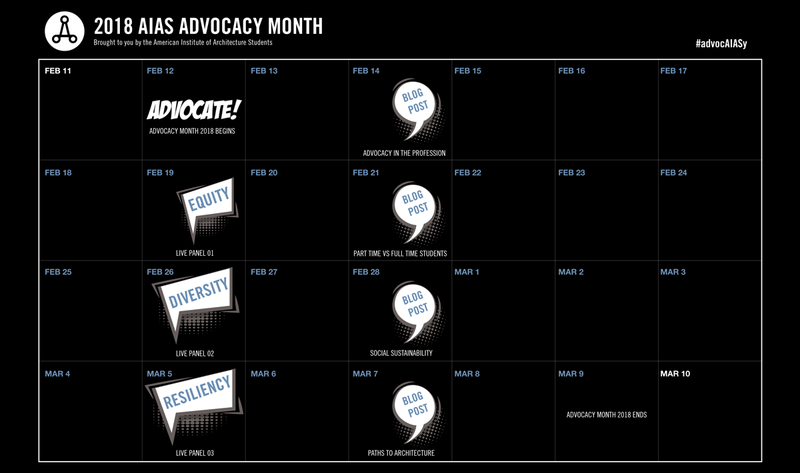 AIAS > News > Uncategorized > Advocacy Month is Live! In addition to the Advocacy Panels, weekly blog posts will be published right here on the AIAS website! This week’s post will cover “Advocacy in the Profession”, the second post will discuss “The Relationship Between Part-Time and Full-Time Students”, the third post will discuss “Social Sustainability”, and the final post will discuss “The Disparate Paths to Architecture”. Finally, look out for Advocacy takeovers on the AIAS National Instagram account (@aiasorg)! The wonderful members of the Advocacy Task Force will be showcasing a range of advocacy-related events, symposiums, environments, and schools around the country, so stay tuned! In the spirit of Advocacy Month, please consider joining one of our conversations or starting one of your own on your campus! And remember, if you are interested in participating in one or more of the live panels, please email Juliet Bibla at jeb442@drexel.edu or Amy Rosen at northeast@aias.org.